Pinto beans, green salsa and bite-size pieces of pork tenderloin are at the heart of this recipe for easy-to-make, family-pleasing enchilada chili. Heat dressing in Dutch oven or small stockpot on medium-high heat. Add meat, onions, garlic and 2 Tbsp. cilantro; cook 6 to 8 min. or until meat is done, stirring frequently. Meanwhile, mash half the beans in small bowl. Add mashed beans, remaining whole beans, salsa, broth and corn to meat mixture in pan; mix well. Bring to boil; cover. Simmer on low heat 15 min., stirring occasionally. 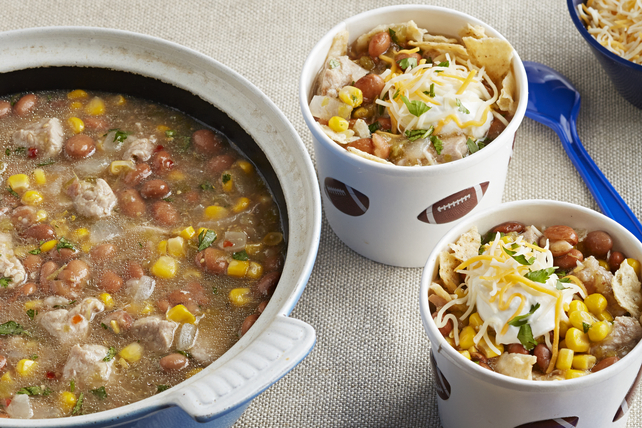 Place 1/4 cup crushed chips in each of 8 serving bowls; top with chili, sour cream, cheese and remaining cilantro. Prepare using cut-up boneless pork chops or chicken thighs. Don't skip the beans...they make this dish very high in fibre at 11 g per serving.